Fate and fall line magic were at play when it comes to our ski love story. You could say it all started when my new stepfather rode the Gunstock chairlift with Doug Burke, my future father in law, back in 1978. During that long double chair ascent, my stepdad bought a ski lodge in Vermont sight unseen. So our family packed and moved to Smugglers Notch Vermont to run the Red Fox Alpine Lodge. That is another ski story – Animal House in ski country. My mother worked tirelessly during the winter making breakfast and dinner for hungry skiers, and I made way too many bunk beds in a ski dorm that slept 100 people. It was several years later that I met Greg Burke, the son of aforementioned chairlift real estate broker Doug. I will never forget that day at Smugglers Notch when Greg and my eyes met. Ironically my mother had arranged the meeting, it was her ritual to purchase lift tickets for our lodging guests from Greg in the Group Sales Office, and she insisted I tag along. I was too young at that first brief encounter, 16, but I felt the seismic shift, the stars, the magic, the chemistry… I knew Greg did too. It was electric… Time passed, I grew up a little, but I never forgot him or that moment. I was a ski instructor at Smuggs during my college years at UVM. That’s when I saw him skiing, making powerful smooth arcing turns below me as I rode the Madonna chair. “Who’s that?” I asked, and wouldn’t you know it was Greg, the man destined to be my forever ski date. 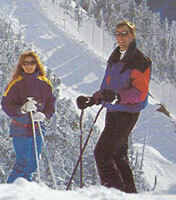 Our first ski date was at Stowe. The sun was high that spring day, the moguls were soft, and my knees were weak, as the saying goes, not just from the many runs we took on the Front Four. It’s all history now, but one thing remains true, skiing is our glue. Our romance revolves around skiing… Greg’s proposal on a snowy Christmas Eve in Zermatt Switzerland, our first out of bounds adventure in Whistler Blackcomb, skiing the backcountry Teardrop trail off the back of Mt Mansfield at Stowe to our first home in Vermont, and later fulfilling our lifelong dream – heli skiing in British Columbia. Teaching our kids to ski was something we tackled together, the fun, the tears, the stress, the expense, and the joy of seeing them excel on skis. 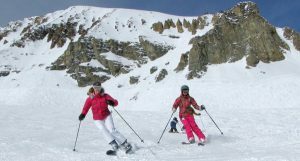 Providing tips on family skiing started our ski journalism endeavor, launching this family ski trips website in 1995, and Luxury Ski Trips in 2008 – now Snow Pak, and The Luxury Vacation Guide in 2017. Skiing is such a romantic sport, at least for us. It’s exhilarating facing the elements of winter, gliding down a spectacular snowy mountain with that someone special. As I think of our best moments together, many have been on a ski mountain somewhere. It’s not always a perfect sunshine, fresh snow day; we have skied in the rain, the howling wind, we even got lost in Zermatt. 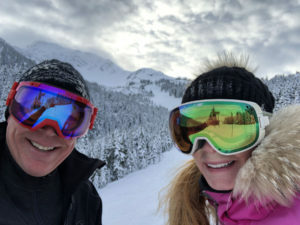 Skiing challenges us both, independently and as a couple, there are lots of ups and downs, just like a marriage. At the end of each day’s alpine adventure, there is a sense of satisfaction, and a healthy warm glow to savor together. Our two kids share in our love of skiing. Ian now loves skiing and lives in Washington – Pacific North West ski country, his fave is Big Sky Montana. Our daughter Aspen is a women’s fashion designer at LL Bean – the world famous outdoor clothier based in Maine. We believe one day Aspen will have her own ski and sports clothing line. 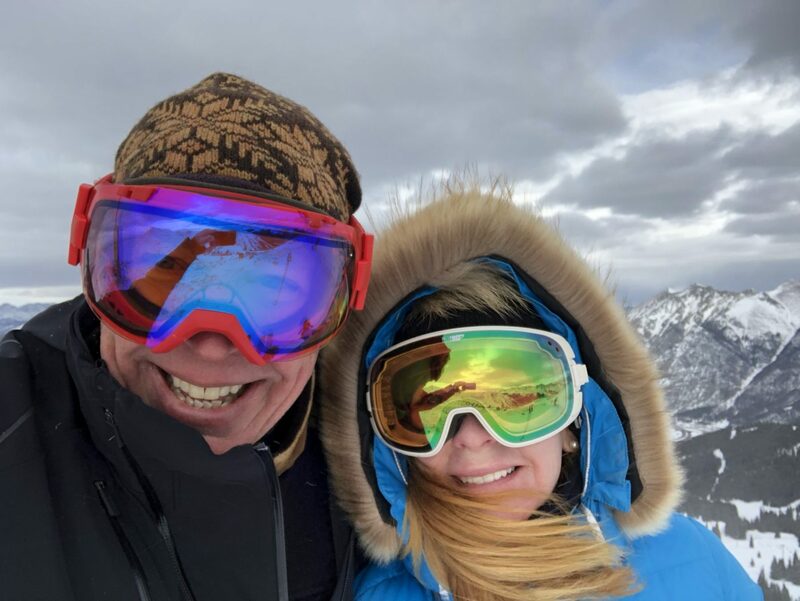 We love skiing, and sharing that passion has been a significant part of our romance, our family strength, and the fate that keeps us on track. There are many ski places we have yet to visit in Europe, and our mutual ski bucket list will bring us there together. I know I am “waxing” too romantic, but I hope you find your forever ski mate.